It’s a fair drive to the windy, plains of Hoogstraten, but the local school students welcomed us warmly whilst directing us where to park. As the parking was some distance we didn’t look for coffee until we got inside and who do we run into straight away? 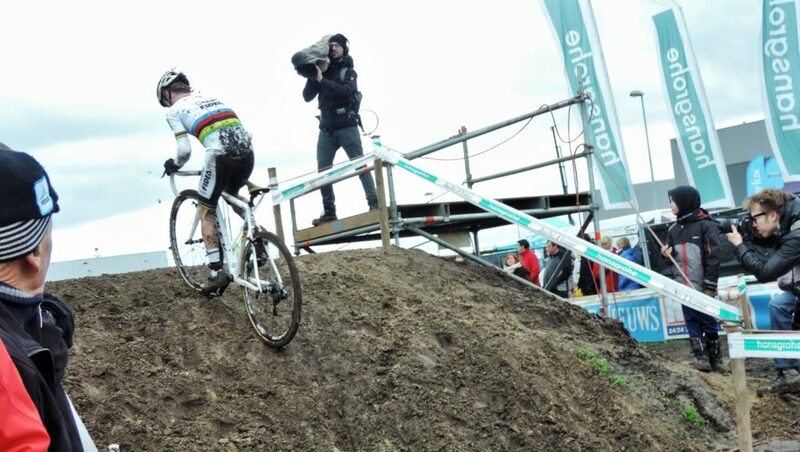 Papa Wellens, of course! We stopped for a chat and a coffee while the Newbies finished their race and the Juniors set off. The first time I came here I was with photographer Wei Yiet Wong, it was my camera’s first outing and we were silly with excitement at EVERYTHING! That day, 2 years ago, Niels and Sven battled through the mud side by side until Niels, inexplicably at the time, had to give way. 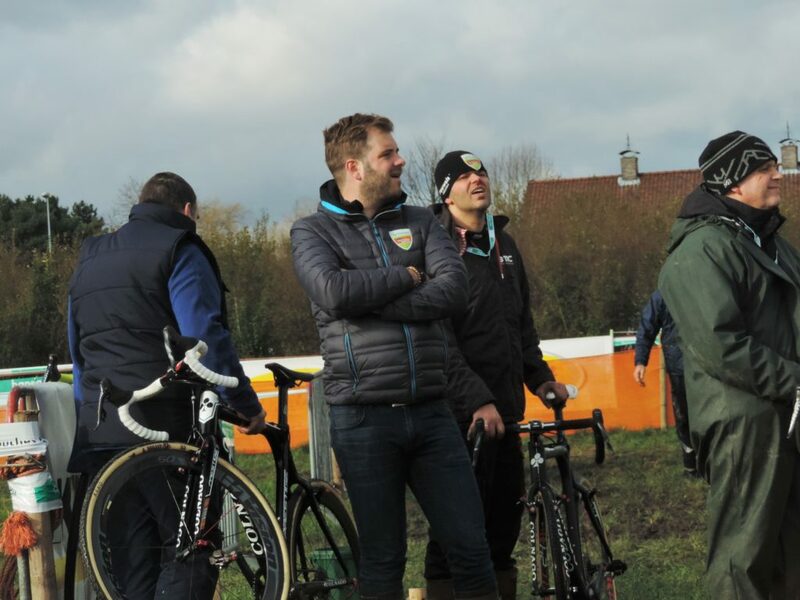 Sven wore the Belgian colours, we cheered for Jonathan Page, we didn’t see the women race because we couldn’t get there by sparrows fart o’clock and the course was flat as. It was extremely deep with the mud though and we froze our arses off in the wind; this has not changed. So what has changed, I hear you ask and the answer is ‘heuvels’! Someone has been having fun with a digger building hillocks which break up the course and make it much more technical. Apart from that there are plently of windy-cornery bits, bridges, steps, planks, a ditch and a whole heap of mud. For the spectators the majority of comforts (*ahem) are around the outside at the entrance with some food and drink stalls in the middle and a couple of Toitoi’s. Today I got my gumboots out for the first time this season and the thermal undies were a welcome addition to my wardrobe! 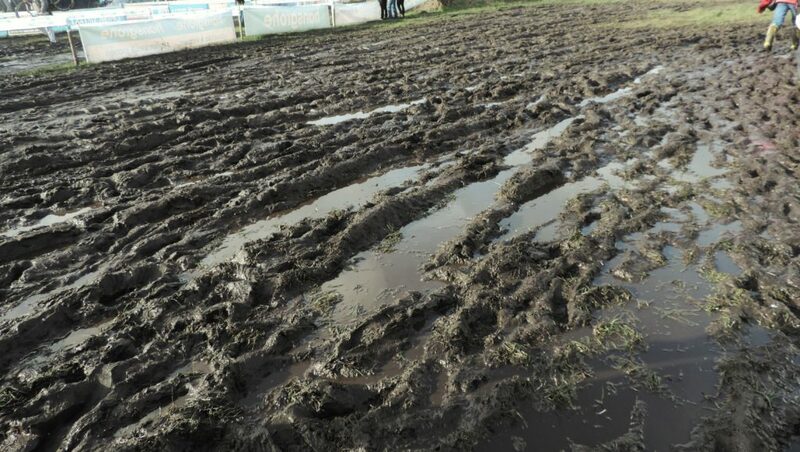 One of our party didn’t have the required footwear and I can see there will be muddy trousers by the end of the day! Looking at some sections there may well be a few lost gummies today too! 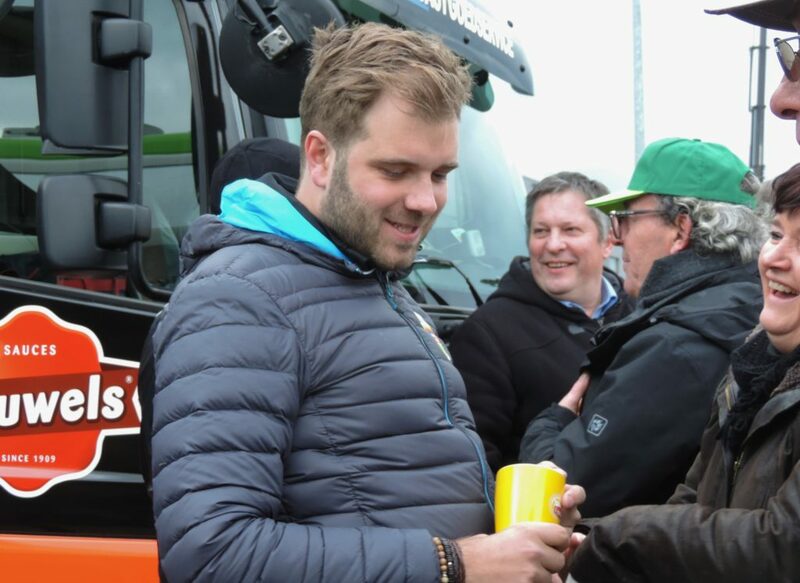 In the race Jens Dekker was about the business of making everyone else look exceedingly ordinary, but I’m glad to say Florian Vermeersch is making some serious progress and proving his podium at Hamme was not a fluke (also not making my faith look misplaced!). 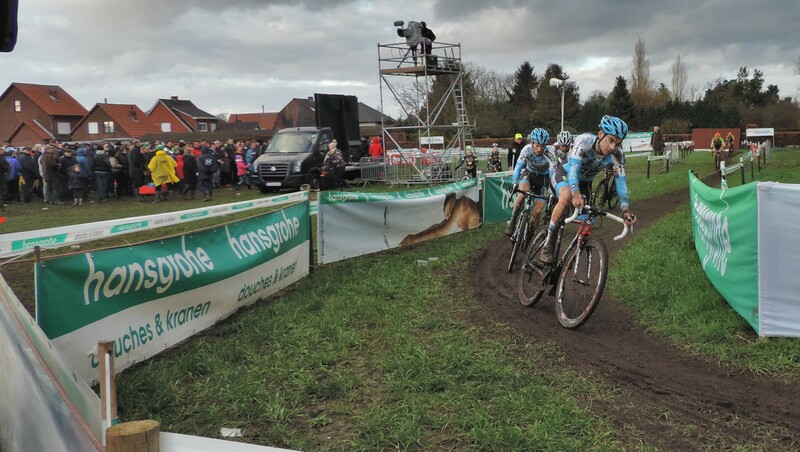 His battle with Seppe Rombouts this time may prove to be interesting in the coming year. Whoop! Whoop! 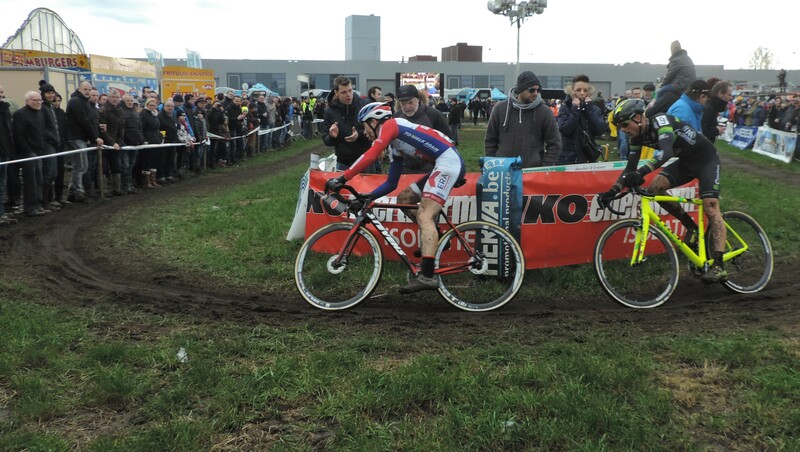 Niels is in the pits to shout encouragement to the young guys. 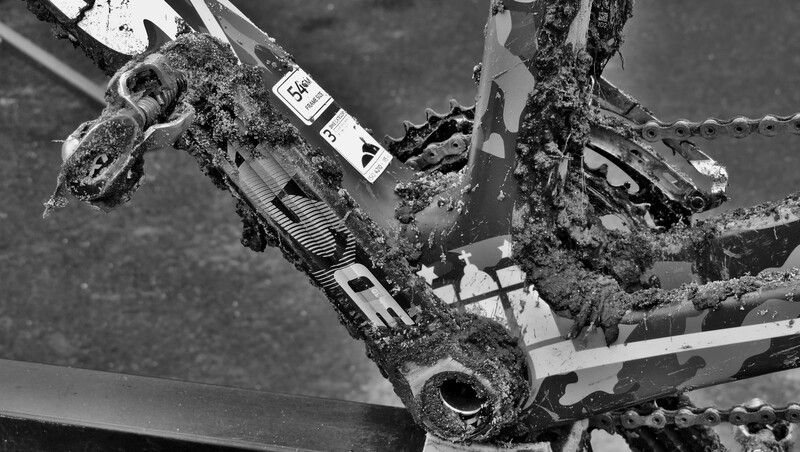 The new hilly bit is proving a little problematic for some not sure whether to try to ride or just run it. 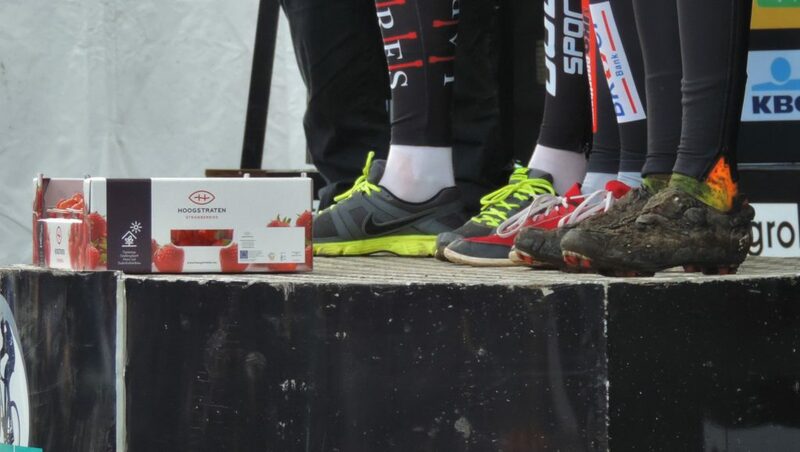 A bit of FYI – the podium finishers are given strawberries and they are calling this event AardbeiCross. What they are doing with strawberries at this time of year is not quite apparent, but they look lush. At first I thought they were tomatoes, which somehow makes more sense to me, but is much less romantic. 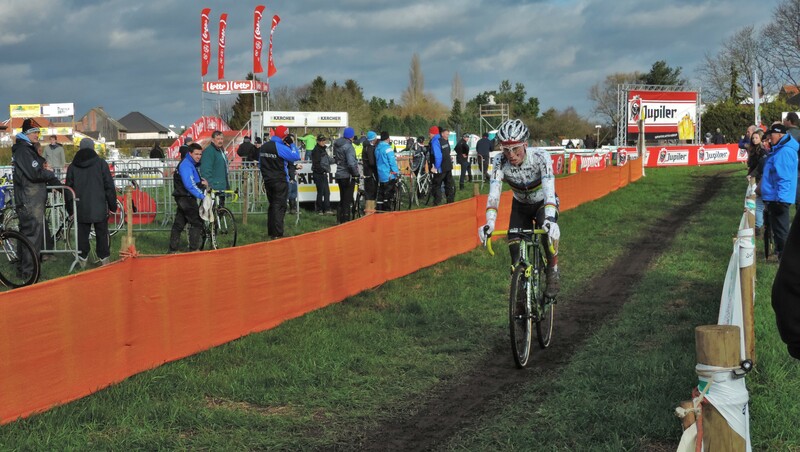 For some reason it was decided to go to the rider busses DURING the U23 race! I’m sure it made sense at the time, but looking back, I have no idea why. The Guys get some strange notions from time to time. 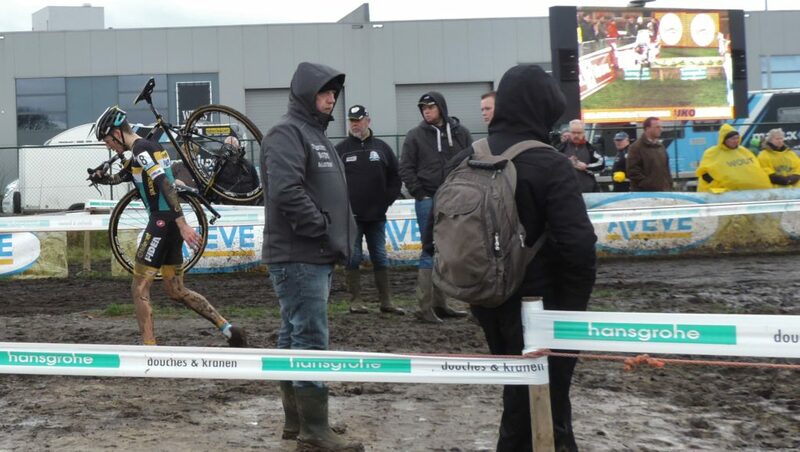 In keeping with the request for more of the support crew I got a nice snap (I think) of the BKCP-Enertherm guys cleaning the mud off Sanne Cant’s Stevens. And YAY! another GPON for the collection. Having left early I was really hungry by the time the U23’s were underway, but TERRIBLE news; the generator for the friets stall had cut out! Get that thing working Pronto! Imagine a day at CX without friets! I wasn’t the only one cheering when someone got the geni working. But DOH! I didn’t have enough tokens to get sauce on my friets – Amateur! Back with the racing and Nicolas Cleppe was just walking off the course when we got back. Not sure what the problem was, but sorry he had to stop. 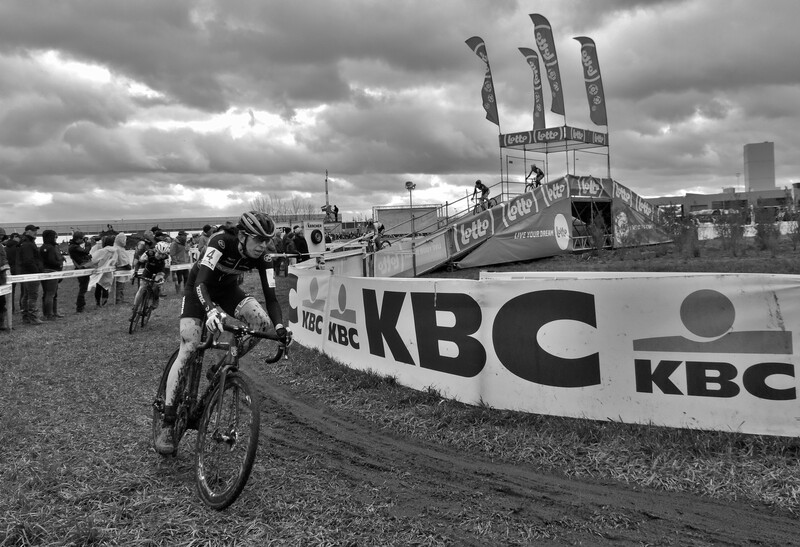 Today was a day for the Young Telenet Fidea squad to show their strength with World Champion Eli Iserbyt racking up another win and Daan Soete & European Champion Quinten Hermans finishing the podium clean sweep. 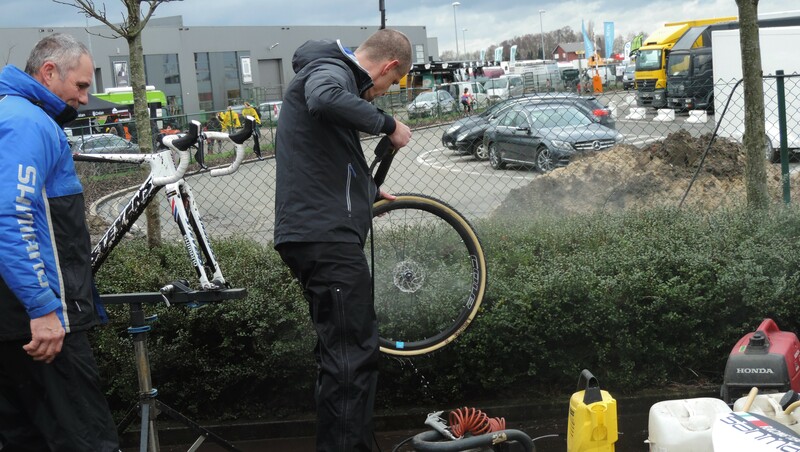 Having already been to the busses there was a long wait between the U23 finish and the Women’s start, which was just as well as the queue for a nature break was lengthy even for those who didn’t require the full, lockable Toitoi! I made my way over to the back of the course where it’s flat as and the wind was strong. 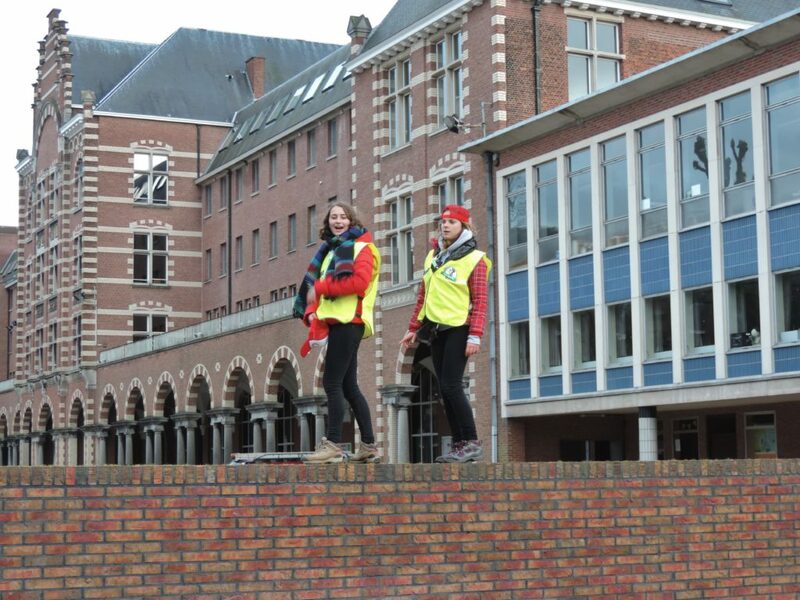 Spotting some K-Pauw Supporters taking refuge by the giant hedge I went to say “Hi” and then watched the men practice the steps. 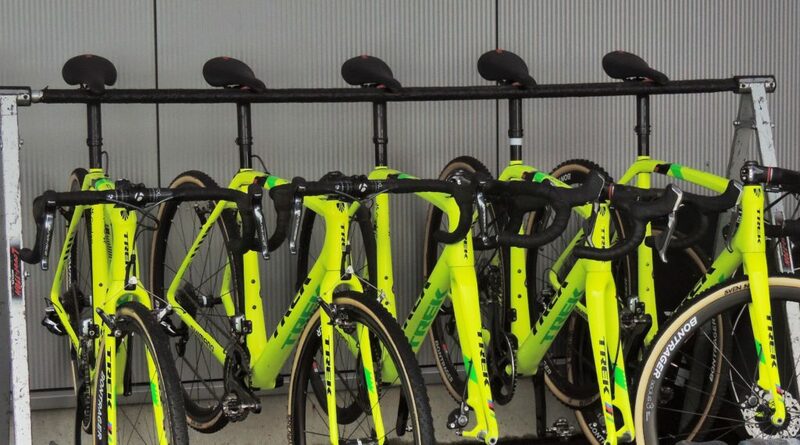 What I have discovered is that when practising without numbers or handy alternative striped kit or not standing together I have great difficulty telling the difference between Mathieu and David van der Poel. Is that just me? 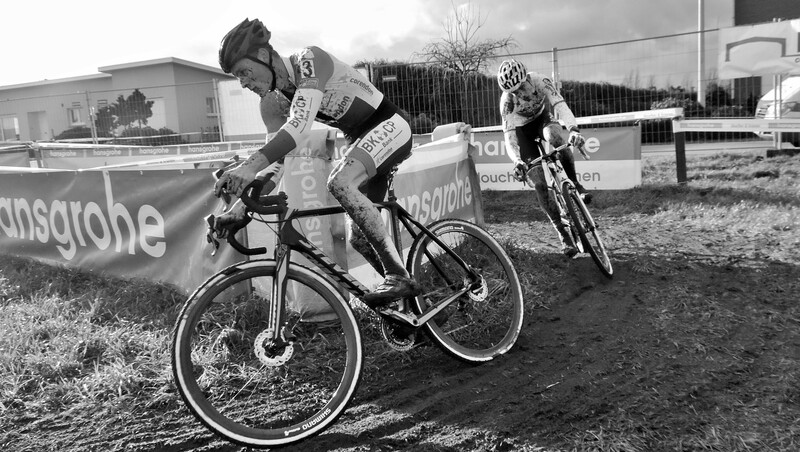 So, eventually we got some more racing and it was time for the women. Nikki Harris was first to the steps on lap one although Helen Wyman was right there with her and next lap would lead them out. 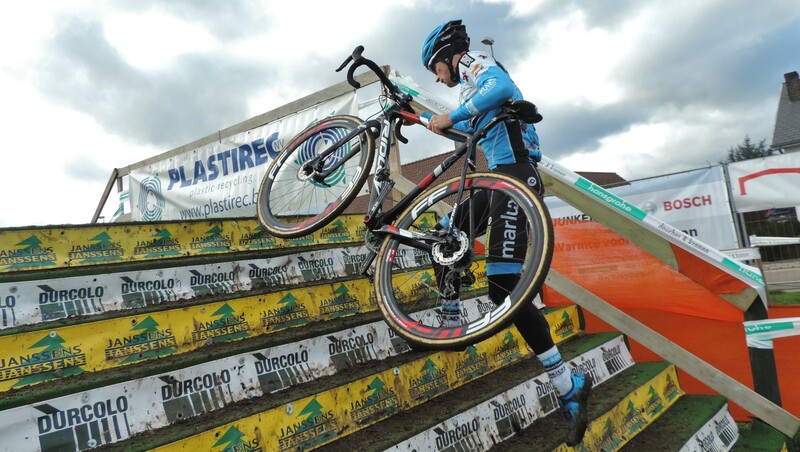 However, we are back to normal service now and Sanne Cant will not be denied the Superprestige crown and Sophie de Boer was continuing her great form to take 2nd spot away from Nikki. Unfortunately for the Helen Wyman fans, she couldn’t manage to stay with the pace and ended up having a right old battle with Havla Pavlikova for 6th place, which she lost. 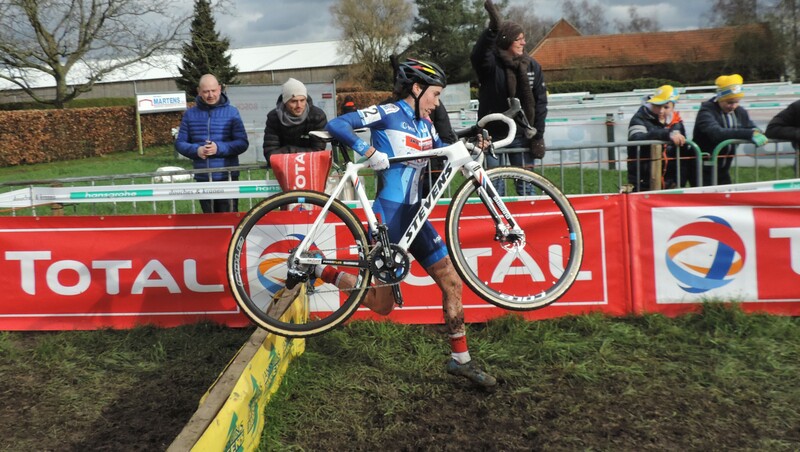 Laura Verdonschot and Maud Kaptheijns fought it out for U23 honours (no prize for that though). 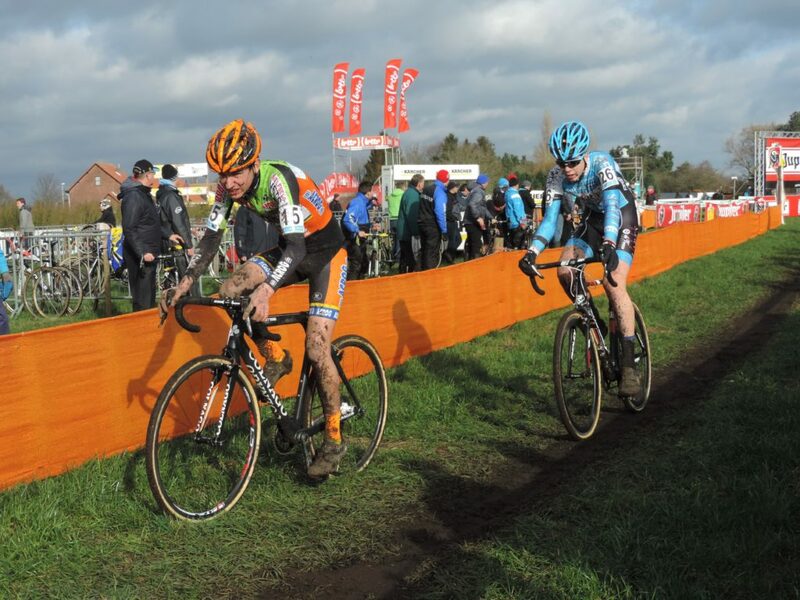 After being an ‘also-ran’ at St Niklaas Mathieu van der Poel decided he might give this one a go and went head to head with Superprestige leader Wout van Aert. Even though his position in the Superprestige is not threatened by MvdP, Wout pushed all the way. 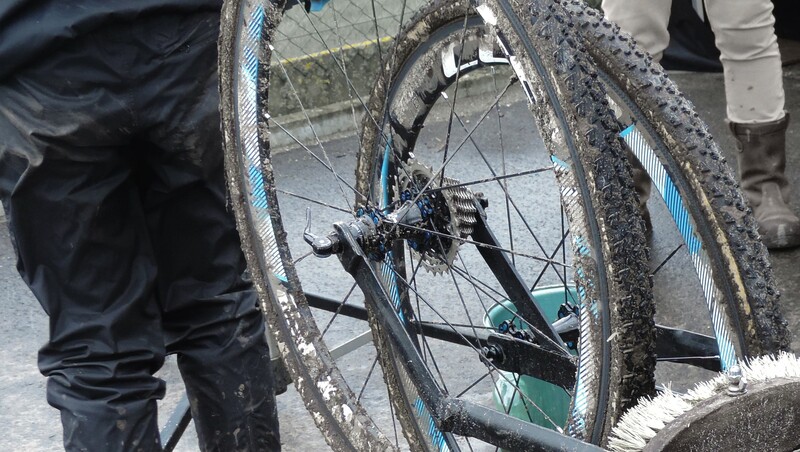 Unfortunately for us K-Pauw supporters the curse of the disc brakes and the back problems has come again and time is being lost to Sven and Lars every lap. We ran backwards and forwards from hairpin to ramp to planks to shout encouragement, but there was nothing we could do this time. 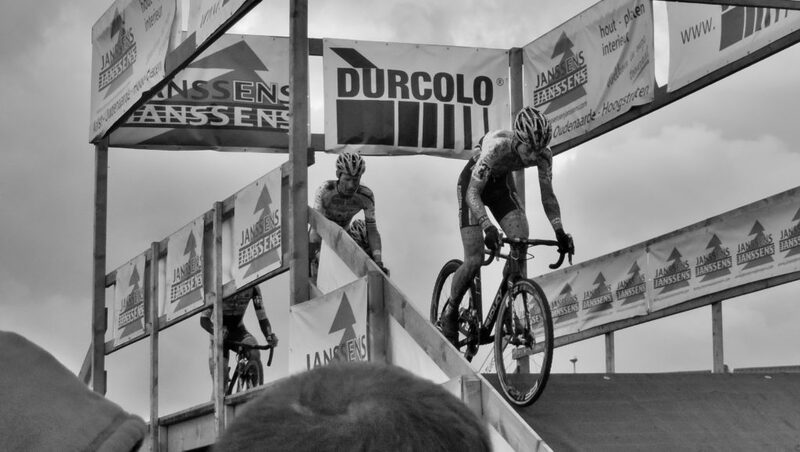 Even sending back Klaas and Gianni to help didn’t work today and that Superprestige podium spot was sailing into the sunset 🙁 The Tom Meeusen fans were having a fabulous day as their man came in 3rd, after riding on his own for most of the race, to grab the last of the days strawberries. 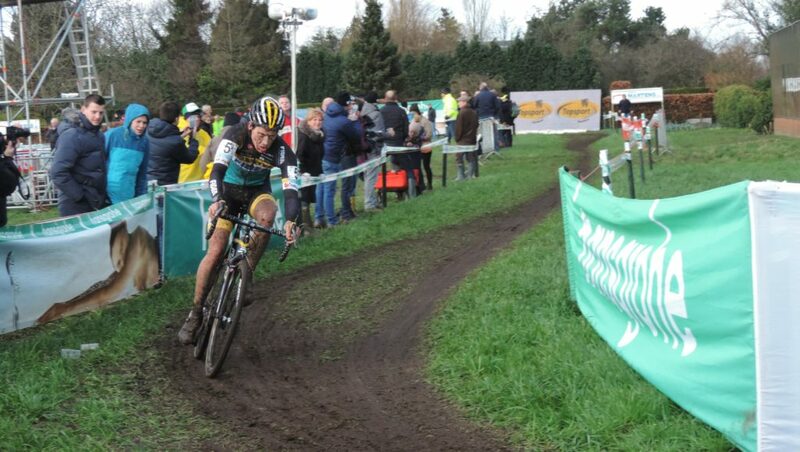 Laurens Sweeck gave battle to Sven. but experience won out this day. Meeting back up with The Guys I wasn’t such a happy bunny, but at least we found a Toitoi still with paper in it and no queue! Back at the car park the school students were still surprisingly chirpy despite a long day out in the cold, and wished us all a safe journey as we joined the traffic heading south. 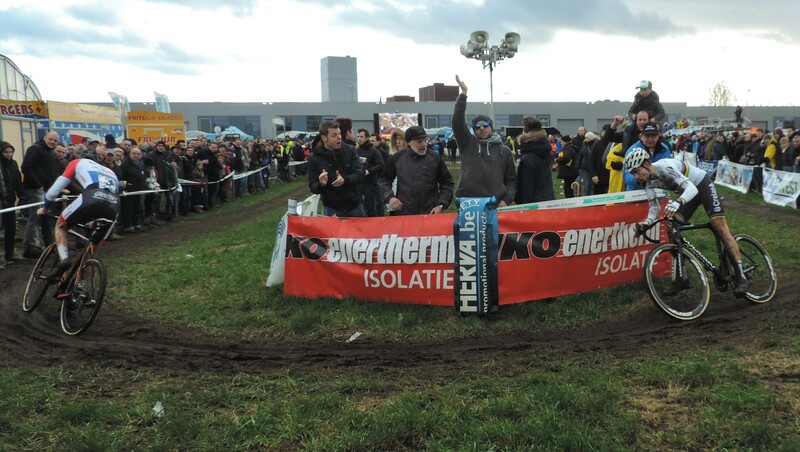 And so we arrange our next trip to Middelkerke, the last Superprestige event of the season and where last year Kevin was victorious but missed out on the over title. At least this year there is the ‘Ladies Trophy’ to celebrate.